Winter’s early years of touring with his original sextet, close contact with the musical community of Brazil, and a growing interest in the natural world and the voices of the earth awakened in Paul the desire to move into a broader realm of music and explore a richer texture of sound. As a result, he formed the Paul Winter Consort. The group incorporated a very different instrumentation from his sextet, but continued to pursue a spirit of celebration and a balance between the improvised and the composed. The result: beautiful natural music that reaches the soul. 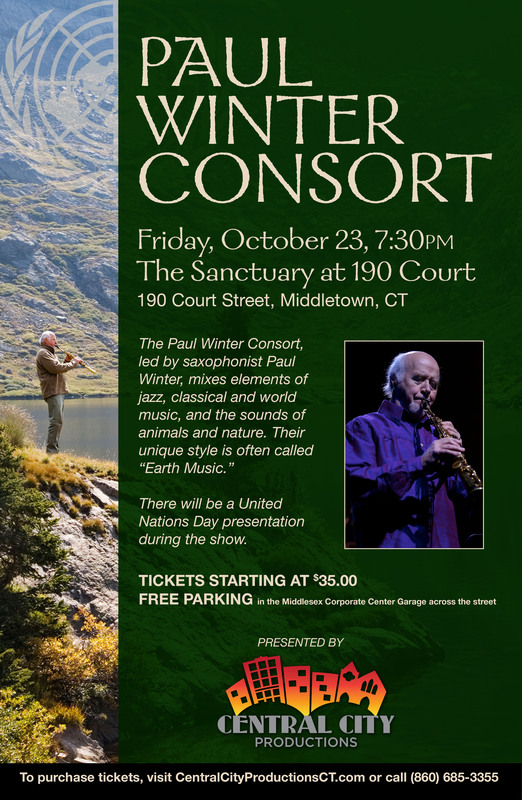 Paul will be performing in the beautiful Sanctuary at 190 Court Street (First Church, Congregational) in downtown Middletown. This 850 seat venue is in a horseshoe configuration and features an expansive balcony – providing excellent views from all vantage points. Copyright 2017 by Central City Productions. All rights reserved. Central City Productions has applied for 501(c)3 non-profit organization status.